Stand out from the crowd with this stunning red BattleBots tee. 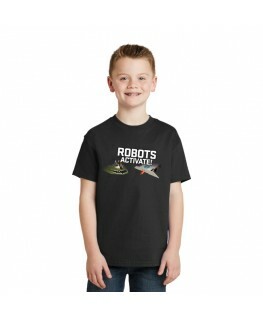 Our most popular youth shirt: the new BattleBots logo on a Charcoal 100% cotton shirt.Specifications:Charcoal Fruit of the Loom Heavy Cotton HD 5-ounce, 100% cotton jersey Size Chart .. 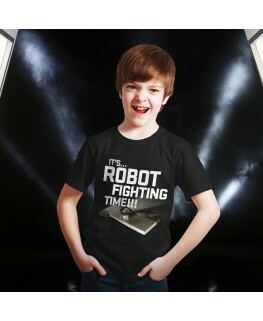 The only official ‘Robot Fighting Time’ shirt – as spoken by FaruqSpecifications:Hane's Tagless 100% cotton shirtColor: BlackSize Chart.. The only official ‘Robots Activate!’ shirtSpecifications:Hane's Tagless 100% cotton shirtColor: BlackSize Chart..